It seems unthinkable but the essential head of every woman’s wardrobe is no longer the skirt, is now the pants. Suitable for casual or elegant look is a must-have summer unfailing 2016. 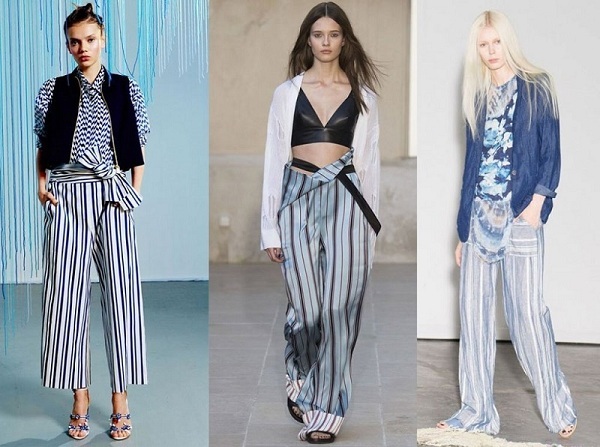 The shows of Spring / Summer 2016 offering practical trousers, comfortable and incredibly glam. For the hot season will be featured models with a masculine cut, moreover it now knows it is women who wear pants, both when it comes to fashion both when it comes to torque. This spring wants to dress a strong woman, self-assured, able to travel without sacrificing their style. So you wait? Everyone in line. 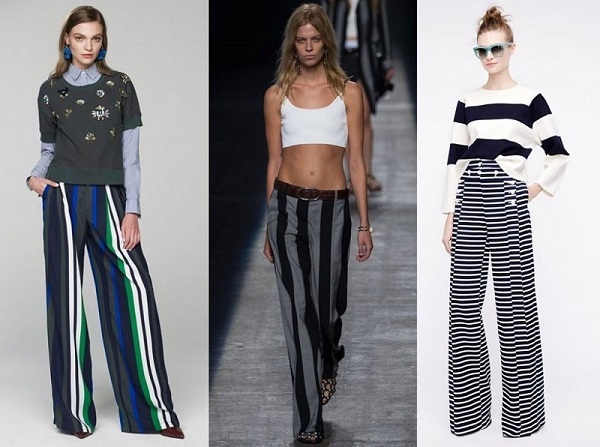 No matter that the pant is a stripe pattern or that there is only a side-line, the important thing is to have it. You can opt for the maxi vertical in shades of gray and black as proposed by Alexander Wang, while for those who take advantage of the beautiful season and dares with colors, Sleepy Jones proposes a model with blue, red and yellow contrast. Summer comes and you feel the smell of the sea, of course, you cannot miss the inspiration sailor. MDS Stripes proposes culottes with the classic sailor’s imagination. J. Crew has reinvented this fantasy using horizontal lines, which also very much like Gareth Pugh and proposes red and white stripes, to be combined with eccentric top with sequins. Do not miss the pajama pants, which remains soft to bounce back to the tradition, which wants the pajama is always lined are the x Each Other brand, Raquel Allegra and Tanya Taylor adds a ribbon to give a touch of femininity. The in flared trousers will continue to be a must even in the hot season, transporting us directly in the ’70s with multicolor prints and fabrics falling light. Spring 2016 will be marked by the return of the lateral line (and no mention of hair). You know the classic suit of Adidas with the two lines of the side, which marked the childhood of every child? Behold, now is the time to dust it off, or better, given the past years, to buy it. On the catwalks do not miss this sporty style, which is always sophisticated and is never synonymous with unkempt. 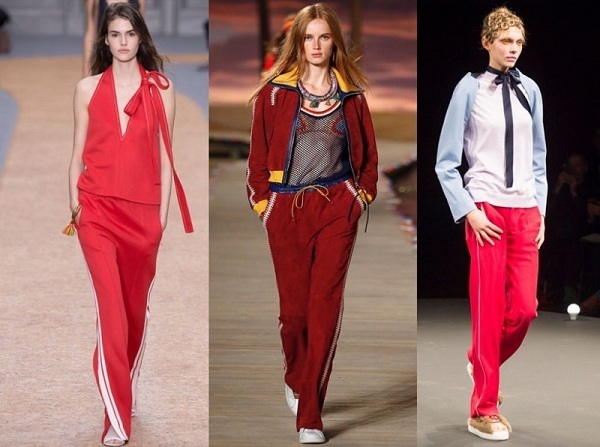 The big fashion houses such as Tommy Hilfiger, Chloé or Undercover offer different jersey pants made with the elastic waist that reflect the American college look.